I don't always have a finished product in mind when I begin a project. It takes time and inspiration to create those little things that could end up making the piece. I started with this dark denim fabric that is very soft to the touch. I knew I wanted to make a jacket but not your traditional jean jacket. I get a lot of inspiration from Anthropologie. They have a jean jacket that is very blousie, cute, but very expensive. I started with the body shape and sewed pleats on the back and bust to have that fitted look. I sewed a couple of bands and gathered them for the bottom to create ruffles that flare out of the existing shape. 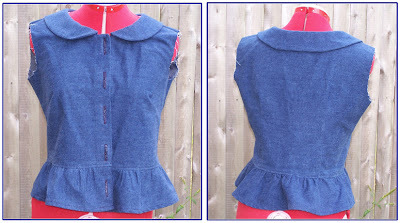 Next was the collar, again going away from the jean jacket look, I went with a big rounded collar to compliment the blouse design. Thats when the sewing ended! What was left were the sleeves and buttons. It stayed on this dress form for a week. 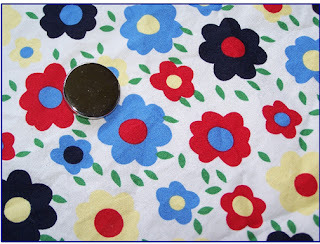 I decided then to cover the buttons with this floral fabric I had left over from a previous dress I made. The sleeves I cut out three quarter length it will be gathered at the ends with a band of the same floral fabric to tie the whole piece in. I haven't finished the jacket since I just thought of this yesterday. When finished I will post the picture with description and tags and best of all where to buy the jacket. Ooh, I can't wait to see the final product. Its wonderful so far!